ON A WET, WINDY, wintry day in the planet’s northernmost capital, Reykjavik in Iceland, a noble bromance blossomed between the world’s two most powerful men. Ronald Reagan and Mikhail Gorbachev shared the romantic vision of a world without nuclear weapons. Analysts suspect the current bromance between their successors is ignoble. It certainly is hard to spot a lofty vision shared by Donald Trump and Vladimir Putin as they meet in another North European capital, Finland’s Helsinki. Unlike the Reykjavik summit that eventually ended the Cold War, the hastily convened Helsinki summit is long on optics and short on details, much less a roadmap to substantive goals. With his decade-long peace overtures to western leaders consistently spurned, Putin knows that only nuclear weapons command international respect and deterrence. Nobody knows exactly why Trump so loves Putin. 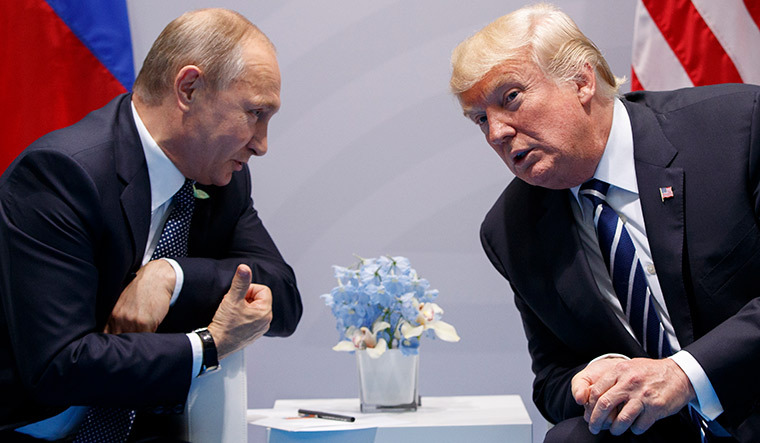 Analysts claim lucrative business deals, sexual exploits and blackmail are the reasons Trump behaves like Putin’s stooge, despite mounting evidence of Russian cyber warfare, espionage and meddling in US elections. Trump, too, is primarily interested in appeasing his domestic base. Preening on the international stage as a global statesman, making peace or threatening war with world leaders, suits his ‘America First’ slogan. But, above all, the TV-ratings addict Trump sees the Helsinki summit, like the Singapore summit with Kim, as a panoramic photo op with him at the centre of global attention. Big audiences matter more than good deals. Summits with secretive, ruthless tyrants are more compelling than couch-talk with transparent, polite prime ministers. Analysts see similarities between Trump and Putin: both are authoritarian demagogues, one a control freak, the other, an uncontrollable freak. “In line with many of America’s renowned mental health experts, we believe that Trump suffers from several psychological pathologies that render him a clear and present danger to the world,” says economist Jeffrey Sachs. Both Trump and Putin are transactional teetotallers, relish zero-sum games, chafe against playing by any rule except their own, enjoy money and power, pomp and ceremony, making history, winning the Nobel Peace Prize…. Differences are equally glaring. Putin is the Salman Khan of geopolitics, repeatedly photographed bare-chested—riding, fishing and swimming during summer vacations. The weight-lifting, gymming, porridge-eating Putin is a nimble, experienced strategic martial artist who pays obsessive attention to detail and prepares meticulously for his meetings. He scrutinises intelligence reports, analyses policy briefs and studies international news bulletins daily, especially before summits. Trump prefers playing golf in his own luxury resorts, gobbling hamburgers, tossing intelligence briefs to watch himself on Fox News. Unlike the Reykjavik summit, with its detailed arms control agenda that eventually ended the Cold War, the rather hastily convened Helsinki summit is long on optics and short on details, much less a roadmap to substantive goals. But Putin has clear goals. Rising to the helm after the ruin of the Soviet empire, he is determined to Make Russia Great Again. With his decade-long peace overtures to western leaders consistently spurned, Putin knows that only nuclear weapons command international respect and deterrence. He inaugurated his fourth term as president by showcasing Russia’s “re-emergence as a global power” with a display of its nuclear arsenal. Simultaneously, he pushed for direct talks with Trump, uncharacteristically shunning protocol by granting audience to the visiting US National Security Advisor John Bolton. Putin did not keep him waiting, either. In Helsinki, issues of cooperation include tackling terrorism, organised crime and arms proliferation, and exploring business opportunities and renegotiating the important Strategic Arms Reduction Treaty (START) that expires in 2021. Russia has significant influence in North Korea, sharing the same goals as China—halting military exercises and withdrawing American troops from the Korean Peninsula. Russia is also a key player in Syria, forging strong ties with Iran and now increasingly with Saudi Arabia and Israel. 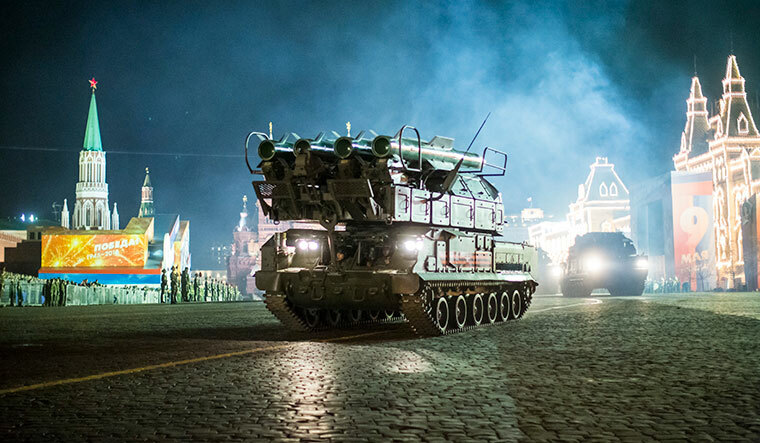 Confrontation lurks over Russia’s cyberwar and sanctions imposed following its 2014 annexation of Crimea. Even if Trump wanted to, he cannot end sanctions because the Congress, Pentagon and the state department will not let him. Anti-Russia sentiments run deep in the US. “You’ve got to rap them on their knuckles every now and then, or they are going to steal your lunch,” says Hoffman. The western narrative ignores that Putin annexed Crimea largely due to NATO’s eastward push since the Cold War ended. In the wake of the CIA-abetted Ukrainian revolution, Putin took control of neighbouring Crimea, which is of great strategic importance as home harbour to Russian naval fleet in the Black Sea. The Helsinki summit takes place against a backdrop of Russian submarine forays in the Atlantic and NATO’s military exercises in the Baltic. While Trump persistently praises Putin, he perniciously provokes America’s traditional transatlantic political and military allies. The Helsinki summit follows the Brussels NATO summit, where anxious European leaders greeted Trump after he dashed letters to them demanding they increase their defence contribution. He accused Norway of being “the only NATO ally sharing a border with Russia that lacks a credible plan to spend 2 per cent of its domestic product on defence”. He berated Germany for “underspending on defence that undermines the security of the alliance”. If Europeans do not cough up, Trump threatens to lower US military presence in Europe, jeopardising traditional US security guarantees. European leaders bristle at Trump’s tantrums, ultimatums, humiliations, twisted facts, false accusations, and calls to have Russia back in the elite G8. Trump also constantly displays contempt for global leadership, alliances, institutions and a rule-based international order spearheaded by the US after the wreckage of World War II. He obsesses that the European Union plots to “rob our piggy bank”, a childish analogy that reveals his simplistic, often paranoid, worldview. Europeans are reeling under Trump’s trade tariffs, the shifting of American embassy in Israel to Jerusalem, and the withdrawal from the Paris climate agreement and the Iran nuclear deal. A united EU and NATO’s backing gives Trump more leverage as he faces Putin in Helsinki. Harvard Professor Stephen Walt, however, says “Trump’s bull-in-a-china-shop approach to diplomacy is exactly the wrong way to proceed”. Trump’s actions, reactions and sanctions against western allies herald America’s global retreat, creating a messy space that Rising China and Resurgent Russia will fill. Long gone is China’s “peaceful rise”. President Xi Jinping has ordered his People’s Liberation Army to “transform into a world-class fighting force in the next three decades”. China is already flexing its muscles in the disputed South China Sea and setting up military hubs as far as Djibouti in Africa. “It is a perilous moment; no time for America to step back,” advises the think tank Rand Corporation. Reagan, who is credited with ending the Cold War, began by calling the Soviet Union the “evil empire”. It has been a tumultuous journey from Rainy Reykjavik to Hot Helsinki. Even if Trump reaches an agreement, it will likely be rolled back by the American establishment that sees Putin as the “Prince of Darkness” who “puppeteers” Trump. Still, it would be an achievement if Trump and Putin can take some heat out of the current “hot peace”.